Every village in Nepal has someone who is working or has worked abroad. One third of the country's GDP comes from overseas workers. But there's a high price to pay. Dec 18 2017 (IPS) - Only a few millimeters of corrugated metal keeps us apart from the advancing dusk. Inside the shack, the family has strung cardboard boxes and pieces of cloth along the walls and ceiling to form some insulation from the cold of night. 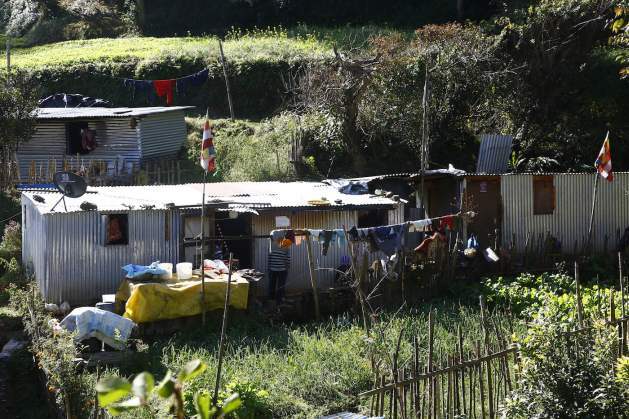 Crowded in the shack are Rohan Tamang, his wife, their two year old daughter and his parents who all live together in the small village of Rayala, which is a three hour car drive south of the Nepalese capital Kathmandu. There is the rippling sound of nearby streams as the village balances on the steep slopes of the Himalayas. Well-trodden paths connect the houses that still stand after the devastating earthquake two years ago. Some effects remain visible. Collapsed roofs and cracks on the sides of buildings. There were over 9000 deaths. Nepal is one of the poorest nations, and it is also the country that is most dependent on the money sent back by its population now making a living abroad. This dependence on remittances has increased since the earthquake. Now 4 million Nepalese, roughly one fourth of the work force, work abroad and generate almost one third of the GDP. Rohan Tamang is standing in front of his house. He too has worked abroad. In Qatar, on a building site. He is well aware of the exact length of time. ”In fourteen days I will return to Qatar”. He has signed a two year contract to make aluminum parts for the construction industry. The salary is around 200 Euros per month. With the money he can save, the family will rebuild their house. I ask the members of his family how they feel about it. 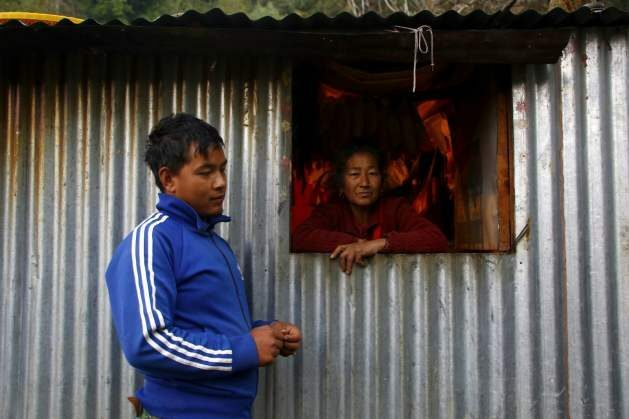 His mother, Chameli Tamang, leans into the window: a hole in the metal wall. ”We haven’t talked about this among us”, adding that her son had been to Qatar once before. It is clearly a sensitive issue. Rohan Tamang tells us of his lasting doubts before making the decision. He knows several people who not only did not get paid, but ended up instead with large debts. They had borrowed the money to bribe recruitment agents in order to get a job. He flashes a Hollywood smile. Omit Gurang has a tailor made shirt and a smile that seems glued into place. Arbetet Global visits the recruiting agency Sagun Overseas Services. The owner Omit Gurang shows us around the brick building in Kathmandu’s business district: Kalikasthan. The whole place feels modern. Well-illuminated, clean, plenty of space and well furnished. Behind a counter two women are speaking to three men that hope to land jobs abroad. Omit Gurand tells us that his firm has just recruited 100 construction workers who will soon depart for Qatar. Then they can pick and choose. Preferably the workers should have training, should speak English and should have prior experience of migrant work in the Middle East. He sits at a massive wooden desk and continues by saying that they send between 1200 and 1500 workers overseas every year. Middle East companies pay the recruitment agencies to locate workers. They also pay visa and travel costs. The only cost the workers need to do is to pay an administrative fee of around 80 Euros. At least that is the official version. In the villages Arbetet Global hear another story told. Labor force: 16 million, of which about 4 million (25 %) work in other countries. Occupational trades: 69 percent work in agriculture, 12 percent in industry and 19 percent in services. Literacy: Of the adult population over 15 years of age, 64% can read and write. Nepal is among the poorest and least developed countries in the world. While the figures for unemployment are low, around 4%, many in the labor force are only partially employed with low salaries. According to the World Bank, only 75% of Nepal’s population have a steady supply of electricity. Villagers seeking jobs need to bribe the local agents in order to be offered a job. The amounts demanded vary greatly. Figures range from 600 to 2000 Euros. In a country where one fifth of the working population makes less than 2 Euros per day, the bribes are small fortunes. The less qualifications, the higher the bribes. Omit Gurang is aware of the bribe system. ”There are those who would pay 5000 euro for an overseas job”. ”Not with us” he adds, disclaiming any involvement, “but if you go to other agencies, this goes on all the time”. He feels that there have been positive changes over the past year for the migrant workers and thinks that the ”Kalafasystem” which supplies the Middle East with laborers, is steadily on the way to disappearing. How about the living standards for those that leave Nepal? The liquor is served warm. It’s moonshine called Raksi, distilled from a mash of rice, banana and apple. A villager has opened their door and invited strangers into their home. We are sitting on the floor, watching the daughter of the family fry vegetables over an open fire. The room is filled with smoke. A curious neighbor comes in through the door. He’s in his fifties and slurs a polite hello. He is quickly handed a glass. ”In the evenings we invite each other over for a drink. I come here, then we go to my house. And on and on”, he says laughing. The men share gossip about the villagers. Newly-wedded husbands are often on their way abroad in order to provide for the family they are starting. It’s a classic story, that doesn’t always end well. In early 2017 the song ”Saili” became a huge hit in Nepal. One could hear it playing everywhere. In cities and in villages. In the bars and in homes. The song is about a young couple in love. The man says he shall travel abroad to work but that they will enjoy a happy family life when they turn 40. The video for the song is five minutes of unending tears. The popularity of the song came through a recognition of both the words and the message: work first and then enjoy the fruits of labor in the future. There is a lot of talk in Nepal about families that are being torn apart. The next morning a group of men have gathered next to the bumpy road that passes through the village. The men stand around chatting. I suddenly catch a glimpse of Rohan Tamang among the young men. He says a cheerful hello. ”I’m just off to a nearby village to do some errands”, he explains. There are still 13 days to go before he leaves for Qatar.